Rohinyga and Bangladeshi refugees are transported to a navy boat where they will be taken to mainland Malaysia, after they landed at Pantai Pasir Berdengung beach, Langkawi, yesterday. – Reuters pic, May 15, 2015. Malaysia's chairmanship of Asean can be considered a failure if Prime Minister Datuk Seri Najib Razak does not reprimand Myanmar for causing the exodus of Rohingya refugees, scores of whom are dying on boats at sea after being turned away by countries in the region, a DAP lawmaker said today. Klang MP Charles Santiago said the statement by Deputy Home Minister Datuk Seri Wan Junaidi Tuanku Jaafar asking the region to send a strong message to Myanmar to stop persecuting the minority Rohingya community was welcomed but insufficient. "Malaysia is the chair of Asean and it was also instrumental in bringing Myanmar into the 10-member bloc. "We need Najib, as the head of state, to reprimand Myanmar and hold its quasi-civilian government accountable for the targeted persecution and killings of the Rohingya," Santiago said. He also said Wan Junaidi was displaying "sheer ignorance" by saying that the Rohingya should return to Myanmar if their boats were fine, as there was "no war" back home. "State-sponsored violence has been unleashed against the Rohingya for decades now. They became stateless in their home country, when the 1982 Citizenship Law robbed them off their citizenship," Santiago said. The DAP MP said Malaysia has been criticised for turning away the refugees by the United Nations, opposition leaders, human rights workers and civil society. "Even Malaysia's former cabinet member, (Tan Sri) Syed Hamid Albar, has said the Rohingya refugees must be allowed to land here. "Despite the uproar, Najib is silent… and Malaysia’s chairmanship of Asean would have been a failure," he said. UN Secretary-General Ban Ki-Moon said other countries had a duty to ensure that the refugees were given assistance and not made to return to their country where the could be subjected to persecution. "The secretary-general urges governments to ensure that the obligation of rescue at sea is upheld and the prohibition on refoulement is maintained. He also urges governments to facilitate timely disembarkation and keep their borders and ports open in order to help the vulnerable people who are in need," the UN said in a statement. Leaders of Southeast Asia should intensify individual and collective efforts to address the situation and tackle the root causes, "which are often human rights violations", Ban said. More than 1.3 million Rohingya – viewed by the United Nations as one of the world's most persecuted minorities – live in Myanmar's western Rakhine state. AFP reported yesterday that Malaysia turned away two boats carrying hundreds of migrants. The wire agency also quoted Wan Junaidi saying, "Of course, there is a problem back home in Myanmar with the way they treat the Rohingya people. "So that is why we need to send a very strong message to Myanmar that they need to treat their people with humanity. They need to be treated like humans, and cannot be so oppressive." 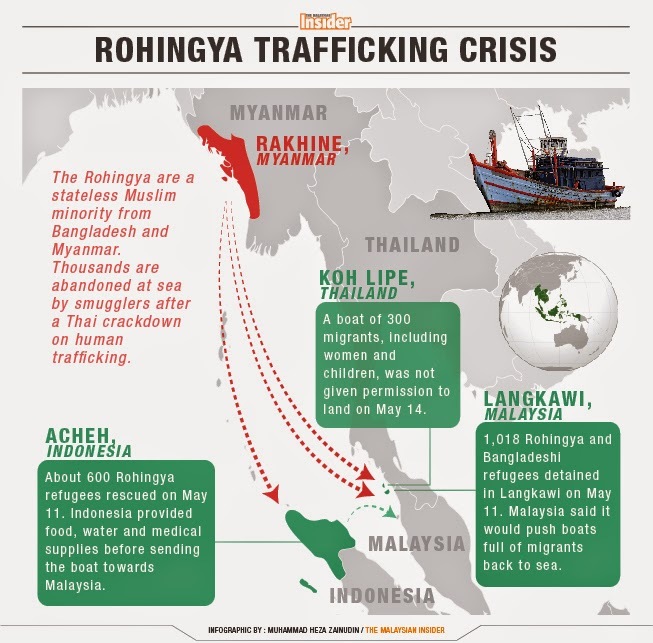 Starving refugees on another boat of Rohingya which turned up in the waters off Thailand told AFP that 10 people had died on the journey, their bodies thrown by others into the sea. Many young children were among the weak-looking passengers on the wooden boat, which was found near the southern Thai island of Koh Lipe in the Andaman Sea. Thailand has called for a regional meeting on the refugee crisis on May 29. Like other countries in the region, the kingdom also has a policy of not allowing refugee boats to berth.